What plans do Leadbetter & Murphy offer? We’ve been helping generations of bereaved families here in Wavertree since George Leadbetter and Michael Murphy founded our company after World War II. 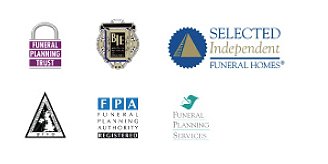 Today, we offer all the experience and expertise of our 30-year affiliation with Craven (the largest independent funeral providers in Merseyside and North Cheshire) together with the intimacy and care that comes with being a husband and wife team. We’re run by Eifion and Violet Wynne-Jones who pride themselves on listening carefully to your requirements and delivering the excellent customer service that you deserve during this difficult and emotional time. Our extensive services are tailored to you: whether you need a basic funeral costing just £695.00 or something more formal, a traditional wood coffin or a granite memorial. Not forgetting the unique small touches that really matter: from a personalised coffin to a chosen cortege route and individual music and readings. We’ll help you create a fitting tribute to someone special, including placing an obituary notice, organising the transport of the cortege and advising on the wake venue. You may also be interested in finding out more about our award-winning funeral pre-payment plans, the caring and sensible way to help ease future financial worries for your family. Arranging a funeral? Click here to send us your details.